Today, Opera took another step forward to solidifying their place as the mobile web browsing leader with the release of the new versions of their two mobile browsers. Opera Mini 6 and Opera Mobile 11 are immediately available for download on a large number of platforms. 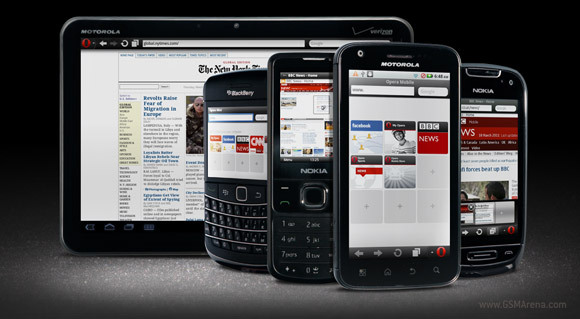 Opera Mobile 11 utilizes the full power of HTML5, Flash (where supported) and the Opera Presto browser engine, which is used in the desktop version of the Opera 11 browser. Both the Mini 6 and Mobile 11 now support pinch-to-zoom, improved scrolling, panning and zooming, and a share button, which let's you quickly share any page to Facebook, vKontakte, My Opera, and others. We took the two new browsers for a spin and we have to say we are pretty satisfied with their performance. We have seen smoother zooming and panning, but it's good enough not to become irritating. The new Opera Mobile 11 is compatible with Windows 7 tablets, too, so if you happen to have one you might consider giving it a try. The Opera Mini 6 is available for the Android, Blackberry, Symbian/S60 phones and the J2ME framework. As for the Opera Mobile 11 you can get it for Android, Symbian, MeeGo, Maemo and Windows 7 desktop (don't confuse it with Windows Phone 7). Happy browsing!